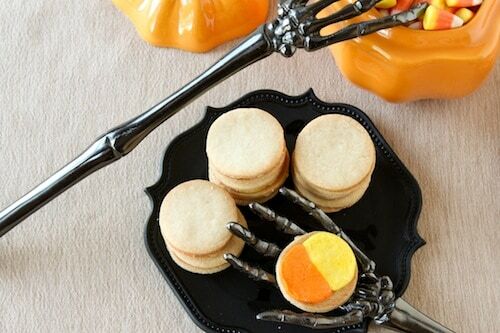 Homemade Candy Corn Oreos | Good. Food. Stories. “You smell the candy corn before you see it,” said Max Falkowitz in his Candy Corn Oreo review on Serious Eats. I read that line and a shiver went down my spine. To sully the name and flavor of my beloved Oreo seemed like a Frankensteinian blasphemy, a hybrid creature so foul that I thought the pitchforks should come out immediately. However, as a certified snack expert, I felt it was my duty to grab a bag in the name of science and get down to business. I needed to confront these orange-and-yellow Oreos in the flesh and see if I could truly come to terms with making a homemade version. Like a horror movie monster, once freed from its hermetically sealed tomb, the smell of chemical sweetness snuck up behind me while I whisked and kneaded, hovering threateningly over my shoulder, breathing down my neck just out of sight until I whipped around to find… nothing there. The yellow bag sat placidly on its shelf in the pantry, masking the terror within. All right, all right. I’m verging on hyperbole here, as amusing as the Halloween horror metaphor might be to write. The limited-edition Oreos, as many have already noted, don’t quite match up to the taste of real candy corn. They’re more overtly sugary and, yes, artificially flavored than the waxy candy itself, as impossible as that may be to imagine without doing a head-to-head bite-off. But it’s true. The homemade version I’ve developed below takes the best of both worlds, giving you teeth-rattling sweetness with the honey undertones that so many have detected in candy corn. They’re just like the real thing, only without that creepy chemical odor—and best of all, they’re not restricted to a particular store or season. 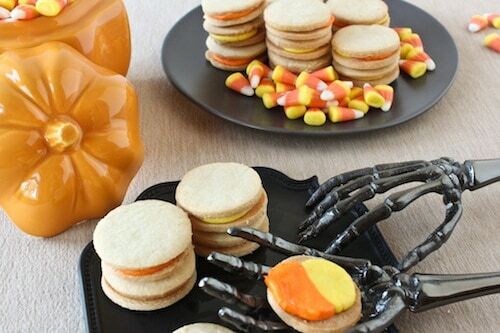 With this recipe, anyone infected with the Candy Corn Oreo craving can make them year-round. And if I may channel The Most Interesting Man in the World for a moment, I don’t always use food coloring, but when I do, I use AmeriColor gel paste food coloring for the widest range of vivid color without too much mess. Remember when you would squeeze out an entire bottle’s worth of the liquid food coloring just to make one batch of red frosting as a kid, otherwise you’d be left with something sort of reddish but really carnation pink? You won’t get that with gel food coloring. It’s freakish and definitely not found in nature—but then again, neither is candy corn. Whisk the flour, baking powder, and salt together in a medium mixing bowl and set aside. Beat the butter, shortening, and sugar together in the bowl of a stand mixer fitted with the paddle attachment at medium speed for 3-4 minutes until the butter is whipped, fluffy, and pale. Reduce the mixer speed to low and add the egg, stirring for 30 seconds until fully incorporated, then the honey and vanilla extract. Add the reserved flour incrementally until fully incorporated and a soft dough forms. Divide the dough into two equal pieces and wrap each tightly in a piece of plastic wrap. Refrigerate the dough for 1 hour. Preheat the oven to 350˚ and line two baking sheets with parchment paper or Silpat liners. Liberally flour a clean work surface and rolling pin. Roll one of the dough discs to 1/4-inch thickness and cut out 1 1/2-inch rounds with a cookie or biscuit cutter. Transfer the rounds to the prepared baking sheet and repeat with the remaining dough. Bake for 8-10 minutes, just until the cookies are no longer shiny on top but barely starting to color around the edges. They will seem underbaked, but the high sugar content of these bad boys means they’ll go from golden to burnt before you notice. Transfer the cookies to wire cooling racks and cool completely before filling. Stir the powdered sugar, corn syrup, honey, vegetable shortening, vanilla extract, and milk in the bowl of a stand mixer fitted with the paddle attachment on low speed until combined, about 30 seconds, then beat on medium speed until whipped and firm. Dribble about 4 drops yellow food coloring into one bowl, and orange food coloring into the second bowl. Knead the food coloring into the filling with a sturdy silicone spatula until no streaks remain. Roll the filling into balls a little more than 1/2 inch in diameter and place on the underside of a cookie (see photo below). Place another cookie on top and press gently, shimmying slightly to adhere and squish the balls out into equal halves of filling. Repeat with the remaining cookies and filling. 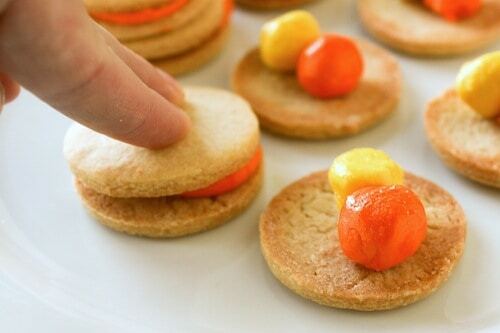 Sandwich cookies will last up to a week stored at room temperature in an airtight container.